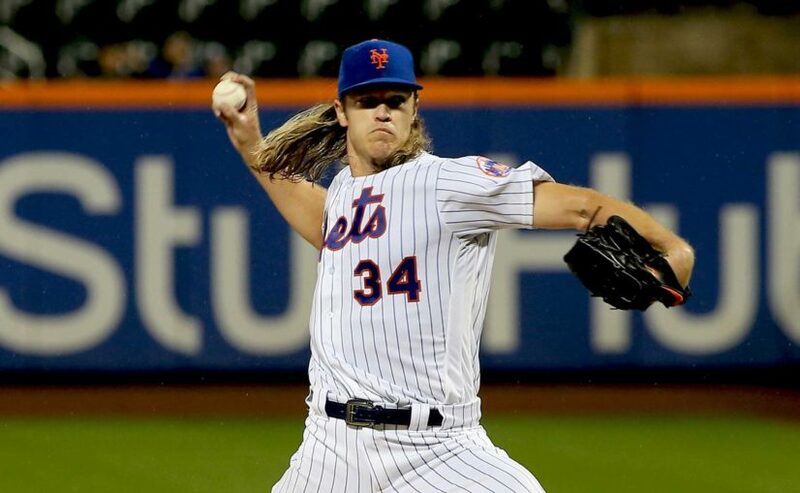 It's no secret that the New York Mets are listening to the offers of their star right-hander Noah Syndergaard. The initial interest shown by the San Diego Padres has generated additional excitement from Cincinnati, Milwaukee and Colorado, but, alas, everything seems to indicate that the Brothers are the best solution. Mets do not necessarily need to move their flamethrower aged 26 but if strengthening the present and the future of this organization by astronomical but well diversified return is a possibility, the general manager of the Mets Brodie Van Wagenen would have to 39; other choice than to listen. On Monday, Kevin Acee, Padres beat the writer for the San Diego Union-Tribune noted that San Diego is "firmly at stake" for Syndergaard, adding that "many baseball people are convinced [he] will be exchanged "this offseason. Acee reports that GM Padres A.J. Preller was "not willing to include one of their six biggest prospects" in an agreement discussed with Mariners' beginners. James Paxton, which was eventually traded to the Yankees against a bunch of prospects. This would likely include the best prospect Fernando Tatis Jr. – that the sailors were not aiming – as well as the southpaw MacKenzie Gore, field player Luis Urias, receiver / hunter Francisco Mejiaor rollers Chris Paddack, Adrian Morejon, Michael Baez, and Logan Allen. It should be assumed that the Mets would have a little more room for maneuver in the negotiations, but not much. Acee spoke with the MMO on Wednesday about the ongoing trade talks between the Mets and the Brothers, expressing optimism about the possibility of reaching an agreement, while indicating that the valuation of the players was the source of any potential problem. Given the age, skill level and control of the Syndergaard team, Van Wagenen and the Mets will likely give Noah a high enough rating. Let's see what the drummer writer of SDU-T had to say on the subject. MMO: The Padres system is studded with first-rate prospects and a handful of MLB-ready players who occupy positions specifically targeted by the Mets as out-of-season areas of interest (receiver and right-handed player) ). Even without Tatis available, do you see a possible deal between the two teams? Acee: An agreement could certainly happen. You could even say that it should happen. It seems that the abundance of Padres and the needs of the Mets are aligned. What he's doing [or not a deal happens] focused on the value perceived by each team of their player and the players of the other team. The Padres really want to add a quality pitcher. MMO: Given Preller's avowed aversion to dealing with his best players, it should be assumed that a mix of major leagues and candidates will be the only way to attract the Mets and mitigate the reluctance of the Brothers. Recipient Austin Hedges was mentioned as a possible adjustment. Do you see Preller swinging left-handed Joey Lucchesi or Hunter Renfroe reduce marginally the impact of a large trade on their farming system? Acee: Absolutely. Both could be had. The Padres would like to find a business partner interested in Renfroe and / or Hedges. MMO: Obviously, the intentions are present on both sides. Will Preller's offer meet Van Wagenen's request or vice versa? This remains to be determined. Do you see Preller let down on his superior prospects in order to land a guy like Syndergaard? Acee: Not this year. If they were closer or had fewer holes and more players of the top echelon, then I think he would do it. It would not make much sense anymore. We sincerely thank Kevin for taking the time to talk with MMO. Give it a follow up Twitter for excellent coverage and Padres analysis.